City tour around the magical city of Barcelona! Take the Party to Barcelona! 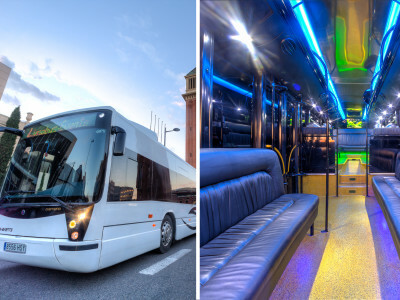 If you and the lads are looking for an awesome, unique way to get from point A to B on your stag do in Barcelona, this party limobus tour has to be it! The Limo Bus is fully kitted out with everything you would expect from a top-class limousine, but it is also packed with MASSIVE extras: 3000w speakers, two bars, disco balls and ceiling lights. With this package you get a one hour trip where you’ll cruise through Barcelona’s city centre with cava in hand, music rocking and checking out the sights of the city in party mode! If you are looking to treat your stag to a particularly exciting journey on the party limobus, you can add a beautiful stripper who will blow your stag’s mind! Get in touch with us for more details.